The Midnight Review: Nikki Haley Violated State Law Because It Was Easier. Nikki Haley Violated State Law Because It Was Easier. "I break the law because it is the easier thing to do!" 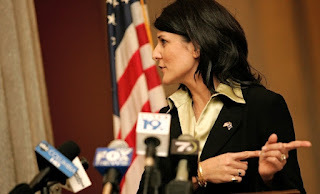 South Carolina governor Nikki Haley is in more hot water recently, and no, we are not talking about another one of her alleged trysts. Instead, Haley and her campaign have gotten into some trouble for using state money to pay for security details while on the campaign trail fundraising. Doing so is a violation of South Carolina state law. What did the Haley camp have to say about their improprieties? Marisa Crawford, a Haley campaign aide, had stated that the reason for violating state law was because it was "easier" then to abide by it. Nikki Haley chose to improperly use state funds because she didn't want to be inconvenienced. Haley may have also created a new way for fledgling incumbent campaigns to stay afloat - use taxpayer dollars to foot the bill and then pay at a later date, sort of like a loan. Now that is being fiscally conservative, don't 'cha think?